Help me out here. Are my kids freaky strong or freaky smart? Or something else entirely? The scenario: After being angel baby all day, Ro pitched a monster fit at bedtime last night. Vigorously shaking her head, saying "no! no! no!" and throwing all of her loveys out of the crib over and over. (The ones she absolutely, positively can not go to sleep without.) I put them back in, left the room, returned after about 15 minutes to put them back in again without a word, then returned a third time 25 minutes later armed with diaper pins. I quietly pulled the octopus' legs around a crib slat and pinned them together, then pulled 2 corners of her bear/lovey around a crib slat and pinned them together. Ha, HA! Now she would calm down and go to sleep for sure! Um, not so fast... When she abruptly quieted after a few seconds, I checked the video monitor to see her happily curled up at the opposite end of the bed from where I had attached the loveys. Hmmmm. And she wasn't making a peep. Hmmmm. The hair on the back of my neck rose and I sprinted back in there to find she had both animals detached from the crib, and there were two OPEN diaper pins dangling from the animals that she was cuddling. I nearly died envisioning the stabbing, eye poking, swallowing, or worse that could have happened! Removed the diaper pins, kissed the top of her head, and shakily left the room. She fell asleep quickly after that -- no doubt soothed by her victory. I, on the other hand, was no longer sleepy at all! After I calmed down I was consumed by curiosity. Obviously I am never using diaper pins near this little Houdini again. But still I need to know. How the hell did she get them open? Did she pull so hard they popped open? (I've tried to recreate this and it would be really tough. Plus they weren't bent at all.) 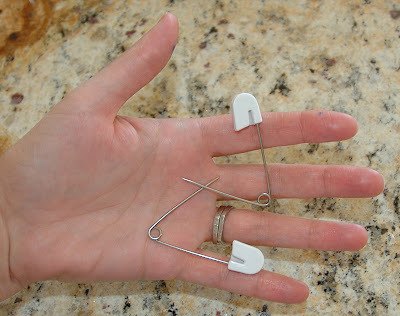 Or did she figure out how to manipulate the really heavy complicated safety pin catch and get those things open? (Again, I'm skeptical. My own mother grunts and groans when she has to open one of these things.) Sigh... I guess we'll never know for sure, but what the heck do you think happened?